This could be your lucky day! Starting on September 10th you have the chance to win a $150 PayPal Cash Giveaway!! 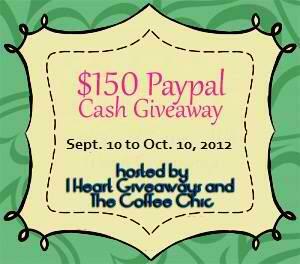 I Heart Giveaways and The Coffee Chic present a brand new giveaway where you can get a chance to win $150 Paypal Cash. The rules are easy! All you need to do is to enter on the rafflecopter widget below to earn entries. Make sure to provide the correct details. Good luck! This event is co-hosted by Zoes Printable Coupons, Stay a Stay at Home Mom and Chic Foodies.